A little east of the mouth of the San Lorenzo River is Wood's Lagoon, which is crossed by two bridges. The Murray-Eaton Street Bridge (36C0108) is a 544 ft long, 9-span precast girder bridge that was built in 1963. The spans are 60 ft long and sit on two column bents with large caissons. 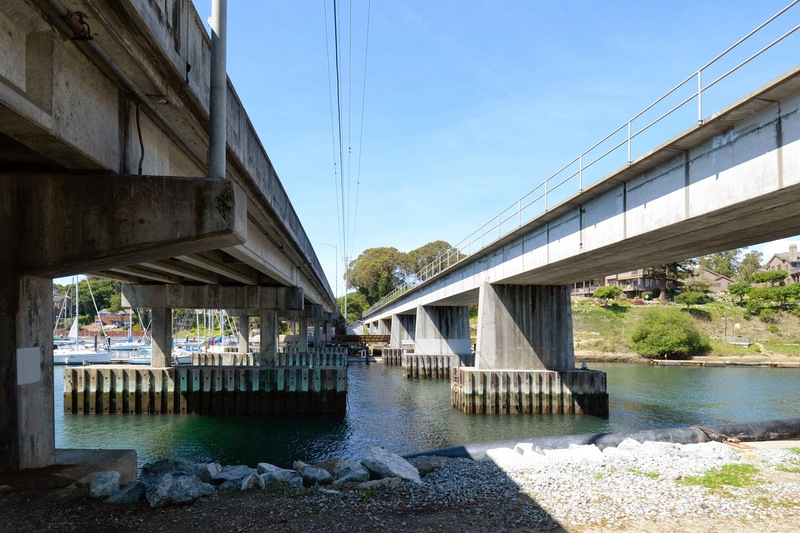 Next to the highway bridge is the SCBG Railway bridge with precast box girder spans on tapered pier walls and with similar caissons, which were made by filling soldier pile cofferdams with concrete. Wood's Lagoon was turned into a protected harbor for yachts and other small craft. The two bridges look similar enough to suggest they were built by the same contractor, maybe at around the time they were building the harbor. Santa Cruz County, California Bridges: Wood's Lagoon Bridges by Mark Yashinsky is licensed under a Creative Commons Attribution-NonCommercial-NoDerivatives 4.0 International License.